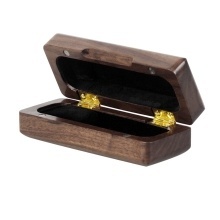 Wooden box designed for storing one saxophone mouthpiece. Solid wood material with smooth surface, exquisite workmanship. Slot inside for keeping your mouthpiece in place, safe and stable. Inner surface covered with soft cloth, no scratch to the mouthpiece. The mouthpiece showed in the picture is not included.